Buy All-in-one Brother MFC 845cw with CISS with CISS and make 30 times more quality prints for the same money! Pay only 0.04 USD for A-4 full color print! brother mfc-845cw printer is a model which starts the series and it probably can't offer all the scope of needed functions, but the design and construction of this MF was planned and executed in a good way. Dimensions are 40.5cm x 38cm x 18cm and its weight is 9kg. It has glossy back ADF fold panel, which is also a feeding tray, the capacity of the auto-feeder is 20 sheets. All the main functions of MFD are executed by key buttons that are located at the control panel. The printer has a 48-bit onboard scanner, with optical resolution 2400 x 1200 dpi. Despite the fact, that in using auto-feeder (scanning) the field of the documents decreases slightly, at the same time it keeps the size of A4 paper medium - 21.6 x 29.7 cm. The noticeable disadvantages of the multifunctional printer is the lack of USB port, device for reading and recording memory cards and button of quick photos operation on the front panel of brother printer mfc-845cw. Main operation buttons such as fax, copying and scanning are disposed in the control panel. Its display is not a sensor one, like Brother MFC-3220C and Brother MFC-5440CN and other more modern models of this series have. Also it has 4 directional keys next to the alphanumeric menu. 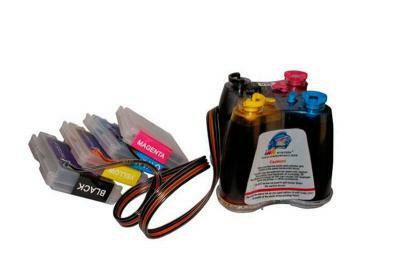 brother printers mfc-845cw offers 4-cartridges system of printing and easy front loading of consumables. The producer provides this series of MFDs with two sets of cartridges: standard cartridges and cartridges with extended capacity: Brother LC-1220 bk/c/y/m and LC-1240bk/c/y/m (the basic package of cartridges is in the package). It has an output tray for 50 sheets in the center of printing device, and under it a closed holder for paper feeding of 100 sheets. It is worth mentioning, that it`s a very compact and functional location and construction of the tray. Besides the fact, that it occupies minimal amount of space, the paper in the tray is isolated from dust and direct humidity, and these facts increase operational life of internal parts of the printer. Unfortunately, you will not find a tray of 20 sheets for photo printing in this model that is available in more expensive ones of this series. A 200 volt power line lace is not separable and comes out of the MFD`s body as an embedded wire. mfc-845cw printer has an opportunitie of connection to PC using a standard 2.0 USB port and Wi-Fi. 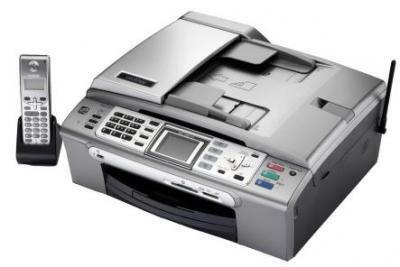 The USB port is inside the printer, and a phone line connecter for fax is at the left side of device. As it was noticed by the manufacturer at the technological exhibitions in such cities as New-York, Florida, Texas, Los-Angeles, Washington, brother mfc-845cw wireless inkjet all-in-one printer was characterized as Energy Star device. During the process of energy consumption measuring, it has been showing perfect results, which are several times better than its competitors in this class did. The greatest result (peak height) was 27W. In the case of monochromatic printing documents with standard settings from 9W up to 16W in color printing is 7-14W, in photo printing is 9-15W. The operation panel is very plain. The model is equipped with 4.9 TFT color display and three hot buttons for activation the device's main functions: copying, scanning and fax. Multifunctional printing device has not got soft-touch screen, the buttons of menu movement are situated on the right-hand side. Thanks to the menu, from the operation panel, you are able to get all the needed information concerning operation and settings of printer. It is supplied with Control Centre 4 application for easy work with all the functions of the printing machine: printing, scanning, copying and sending fax. This application is intuitively clear and doesn't cause any difficulties in usage. Color LCD	Yes, flip-up 2.5"
Carton Dimensions (W"xD"xH")	21.9" x 10.0" x 17.8"
Carton Weight (lbs)	24.2 lbs. Unit Dimensions (W"xD"xH")	18.7" x 14.6" x 7.1"
Unit Weight (lbs)	19.2 lbs.